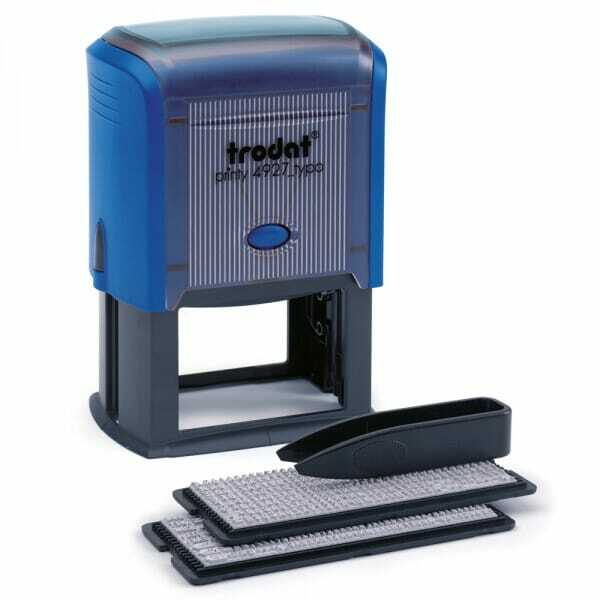 Personalise and create your own D-I-Y self-inking rubber stamp with the Trodat Printy Typo. The 4927 allows you to create your own messages quickly and easily. Each kit contains a self-inking stamp, a selection of different characters, tweezers for setting your message and a replacement pad. All characters are reusable, so can be used over and over creating new impressions each time. The is part of the worlds most popular range of stamps the Printy, it creates an impression of 60 x 40 mm, which can accommodate up to 8 lines of customised text. The Printy Typo is supplied with a built in black ink pad. Should you want a different coloured pad it is possible to purchase a 6/4927 replacement pad, these are available in black, blue, green, red and violet. Customer evaluation for "Trodat Printy Typo 4927 - up to 8 lines of text"